CleanLifeHappyWife – Page 10 – Learning to eat clean, work hard and create a happy healthy life for our family! When I was in grade 12 I signed up for a class called “English Writer’s Craft”. All of the extremely “artsy” students took this class. As I looked around the room I quickly realized I was the odd one out as I sat there in my teal Northern Reflections sweatsuit and french braided hair. (yes, you are correct in your assumption that I wasn’t exactly part of the “cool” crowd! 🙂 ) As I glanced around I saw lots of dark black eyeliner, facial piercings, vintage clothes and multi colored hair. This class was definitely filled with the extremely creative artsy types. On the first day of class, shortly after taking attendance, the teacher (whom had never taught me before) called me out into the hallway for a little “chat”. I nervously slipped out of my desk and walked towards the door. It felt as though all eyes in the classroom were burning into my back. As my teacher began to talk, I noticed she had left the door open and I was quite confident the entire classroom was eavesdropping on this “private” conversation. Miss “T” was nice, but was very blunt and often times a little abrupt. She began explaining all of the expectations for the Writers Craft course. She explained that in order for a student to succeed in this class, the student would have to be creative and imaginative. She wasn’t sure that I possessed the creativity needed to succeed and suggested I drop the class. She assured me that if I dropped the class that day, I could do so without any academic penalty. As I stood there quietly listening and nodding my head, my mind was swirling with questions. “Why didn’t she think I was capable of succeeding in this class? After all, my previous English classes had all been advanced and I had great marks! I was on the Principal’s Honor Roll and was even Student of the Month.” As we returned to the silent classroom it felt as though everyone was staring at me. I could feel my cheeks burning as I quickly slipped into a desk at the back of the room. I sat there wondering if I had a pierced nose, vintage t-shirt and ripped jeans on, if her assumption of my abilities would be the same. As I was walking home from school that afternoon, I couldn’t stop thinking about what Miss “T” had said to me. I would love to say that it didn’t bother me and that my confidence had not been shaken, but the real truth is, her words were hurtful. By the time I made it home from school that day, I knew what I had to do. I was going back to Miss “T” in the morning to tell her that I had decided to stay in the class. I was going to stick with it, work hard and show her that she had misjudged me. And, that’s exactly what I did! Throughout the year Miss “T” had a box where students could submit poetry and short stories that she would eventually compile into a book for students. I had anonymously submitted many poems during the year to Miss “T”‘s box. At the end of the year Miss “T” was talking about some of the poems that someone had submitted. She thought they were very good and was quite curious to know who the author was. When she showed us the poems, my stomach fluttered- they were mine! I decided not to say anything to Miss “T” that day. It didn’t matter anymore. I had worked hard all year and had proven to myself that I could succeed in that class. It’s difficult when you don’t get the support and encouragement that you are hoping for. I learned a very valuable lesson that year. 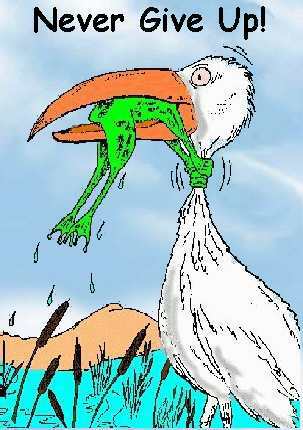 When something is important to you, you just have to go for it!! Hopefully people will rally around you and encourage you, but sometimes they won’t! Sometimes it can be your closest friends or even family members who respond to successes you achieve in an unsettling and hurtful way. I’ve learned that EVERYONE is battling something. For some it is addiction, some it is depression or insecurity, jealousy, temptation, lust…and the list goes on. Perhaps the issues that people are facing in their own lives, make it difficult for them to respond in a positive way to you. Tonight after I put the kids to sleep I went out for a quick run. I usually stay on the quieter back roads because I feel silly running and am a little self conscious. But, tonight it was starting to get dark and I thought it would be a better idea to stay on the main busy road. “I’m being ridiculous” I thought. “I’m sure I don’t look half as awkward as I feel. It’ll be fine”. I was nearing the end of the quiet side street I was on and confidently made a turn onto the main road. I was running for literally 30 seconds when a pickup truck full of college aged boys drove past and yelled “run faster fat-so” out the window. Well that was completely un-necessary” I thought. As I finished the rest of my run, I started thinking about how hard this past 6 months has been. It’s been different than I thought it would be. I was always looking for a health or diet plan that was “easy” and would “fit into my current life”. Isn’t that so funny, if you really think about it? My current lifestyle choices regarding time, priorities, focus, etc. are what got me into this mess in the first place! Yet, I somehow thought that was the “only way” I would be able to stick with something. 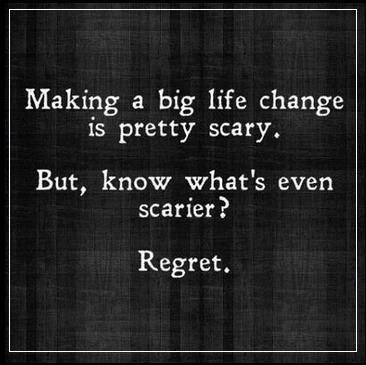 But, do you know what?….I’ve (finally) realized that in order to get healthy I need BIG changes. I needed to shake up my current routine and do things totally different. I think that deep down everyone who shares this battle knows that’s what they need to do, but the thought of that can be very overwhelming. When people say to me, (and I hear this a lot) “it’s just too overwhelming. I don’t even know where to start” they are actually talking more about how to change their daily way of living, not necessarily how to stick to a clean eating or fitness plan. I’ve had to make a lot of tough choices everyday and wake up each morning and actually REALLY focus on my goals and how to achieve them. The truth is; it’s just plain HARD! It’s hard to make food from scratch using new recipes and ingredients that I am unfamiliar with. It’s hard to squeeze the money for healthier groceries and gym memberships into my budget. It’s hard to try to coordinate times with my husband or babysitters so that I can go to the gym. It’s hard to motivate myself to go to the gym at the end of an exhausting day! It’s hard to go to parties and BBQ’s and have limited selections of things to eat and hear people poke fun about your new eating habits. It’s hard to say “no” to yourself when faced with your biggest temptations. It’s hard to get out there and work out and have college boys mocking you! 😉 It is just HARD- but ‘HARD’ is not a reason to give up! It actually takes a lot of INTENTIONAL focus, trying to make one good choice after the next. Don’t you find the most worthwhile things in life are the things you’ve worked the hardest for? I’ve had so many people tell me they just can’t make the switch to living like this because it’s too ‘hard’. I want to assure you, it’s hard for me too- but it’s also sooooo worth it! The best way to start is one little step at a time! Month 3- Cut out all juices, coffee, pop, etc. and only drink water or herbal tea.